On June 4, 2017, under the hot summer sun, Montpelier is prepared to unveil the culmination of 20 years of archaeological and historical research. 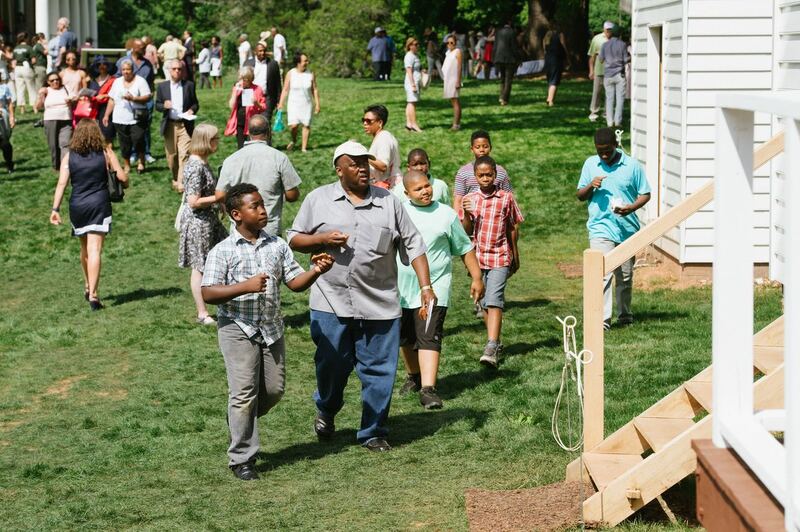 With over 700 people on the property's the back lawn, including benefactor, David M. Rubenstein, the young cultural institution is poised to officially open its groundbreaking exhibition on slavery and the founding era, The Mere Distinction of Colour. Children seated before the opening of The Mere Distinction of Colour. Jenn Fariello for the Montpelier Foundation. After a performance by the Howard gospel choir and a panel discussion about the relevance of discussing difficult history at our nation's culturally significant sites, the hundreds of visitors dispersed onto the grounds to experience the exhibition for the first time. Visitor's experience The Mere Distinction of Colour on opening day. Jenn Fariello for the Montpelier Foundation. The exhibition spans the north and south cellars of the Madison house and continues into the South Yard, the adjacent area where enslaved individuals who tended to the main house would have lived and worked. The north cellar talks about how Montpelier fits into the national story of slavery and how the institution was the economic engine of the young nation. The south cellar explains much of what is known about slavery here, at Montpelier, including the names of those enslaved, tales of their trials and triumphs, and stories told in the voices of their living descendants. The reconstructed South Yard, complete with two smokehouses and two double quarters, are also home to exhibition elements, debunking myths about slavery, and retelling familial stories in the rebuilt, physical structures in which the enslaved would have lived. With many digitally interactive and tactile elements of the exhibition, The Mere Distinction of Colourbrings to life stories of slavery in ways that visitors can touch, feel, hear, and see. 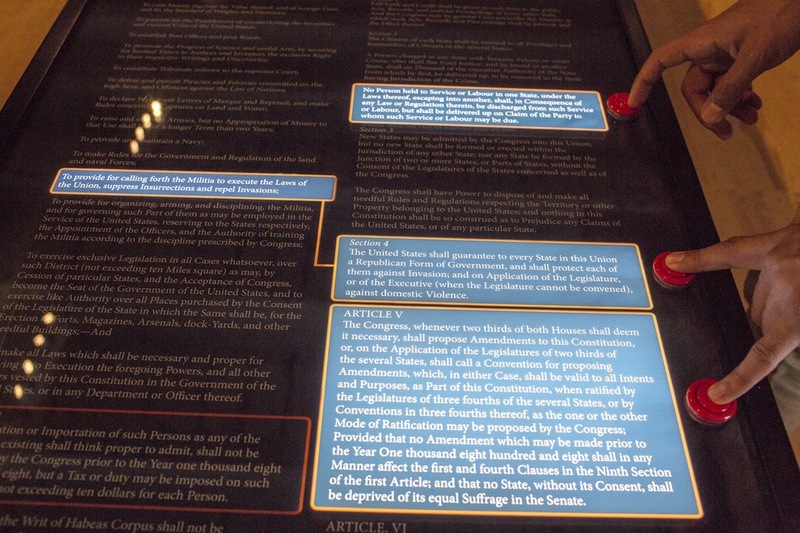 Full length text of the US Constitution, highlighting the places and ways our founding document codified slavery without ever mentioning the word. Eze Amos for the Montpelier Foundation. However, as a site that engages with the public, it's important that there there are pieces of the exhibition that allow visitors to interact with the exhibition and each other in a wholly different way. 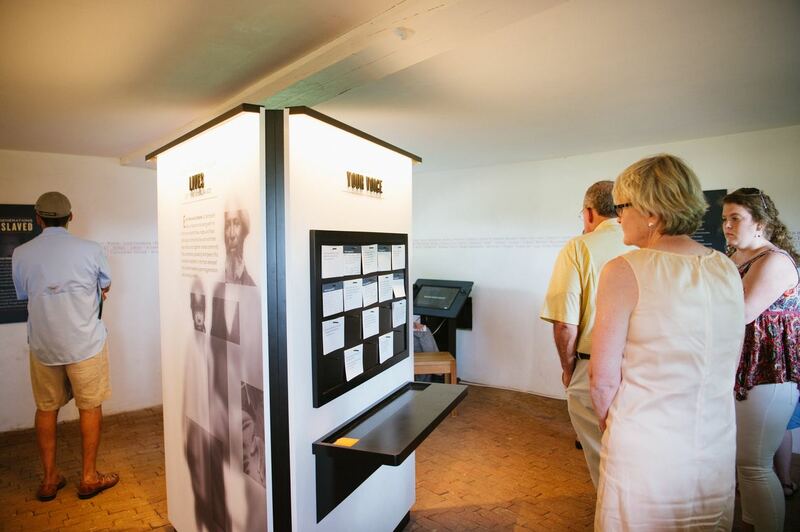 Located centrally in the South Cellar, visitors will find a kiosk, one side of which is covered with comment cards. Since visitors experience this exhibit on their own (not as part of a guided tour), our goal is to invite them to participate in the exhibition by sharing their perspectives with us and with one another. Since the opening of the exhibition in June 2017, hundreds of visitors have shared their reactions, thoughts, and comments in writing. Leave Your Voice kiosk. Kendall Madigan for the Montpelier Foundation. The kiosk, under the banner of "Leave Your Voice," offers visitors the opportunity to respond to pre-printed quotes or to respond unprompted. Quotes were selected, both historic and modern, that reflect different viewpoints on themes in the Mere Distinction of Colour. For example, Morgan Freeman's 2005 statement, “I don’t want a Black History Month. Black history is American history.” hangs alongside "I am not ashamed of my grandparents for having been slaves. I am only ashamed of myself for having at one time been ashamed." from Ralph Ellison's 1952 book, Invisible Man. Visitors reading comments at the Leave Your Voice kiosk. Jenn Fariello for the Montpelier Foundation. 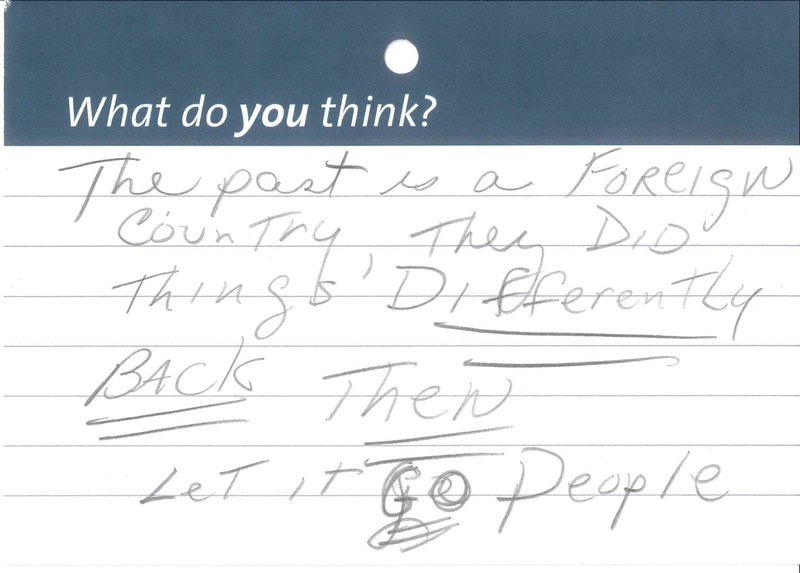 More often, visitor responses detail their feelings and ideas on Madison, the Constitution, slavery, Montpelier, and the state of our nation today. Visitors are not asked to leave any identifying information, however, many sign their work, either with initials, ages, hometowns, race, or a combination therein. 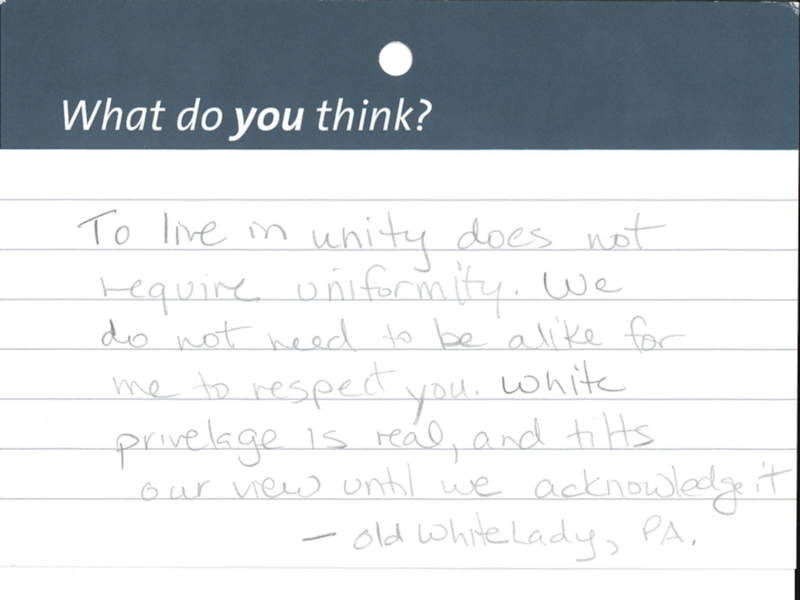 We have received a wide range of viewpoints, written by visitors of all races and ages, from as close as Charlottesville to as far away as Australia. They reflect on the exhibition. Some visitors have used the "Leave Your Voice" cards to comment on the three distinct areas of The Mere Distinction of Colour. Because the exhibition can be viewed in any order it is not always apparent that the visitors have, or will, seen all three spaces. Still, many visitors express gratitude for our authentic account of slavery, racism, and the constant quest for equality that many minority groups in this country faced historically and still struggle for today. They appreciate that we openly address how James and Dolley Madison, other Founders, and the United States more broadly, have not always lived up to the ideals laid out in our founding documents. 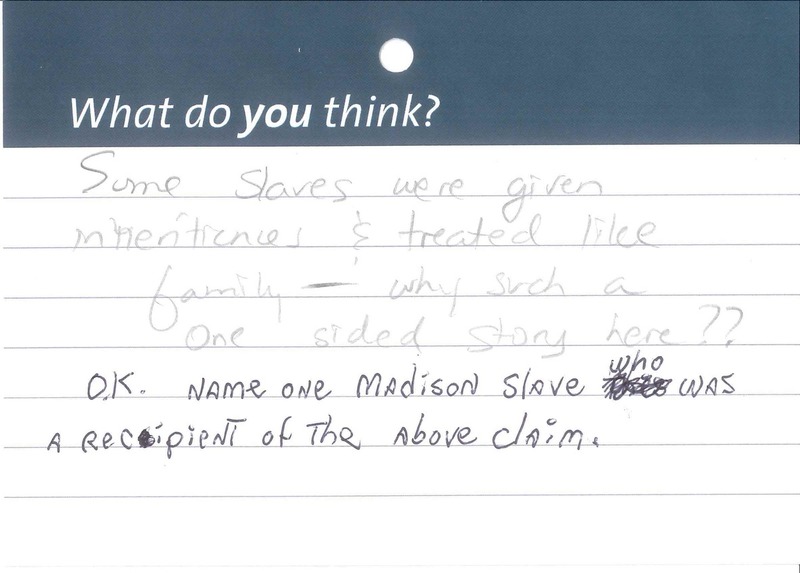 We also hear from visitors who are interested in the contradiction of Madison the enslaver who helped create a country founded on principles of "liberty" and "freedom," while systematically and purposefully denying these tenets to hundreds of people. While they do not disagree with the information presented, they share disappointment when the ideas they encounter conflict with their previously-held knowledge, and even previous veneration, of the founders and their contemporaries. While many of our visitors are intrigued by the content, for some, it's personal. They reflect on their ancestry and personal connections to enslaved individuals. 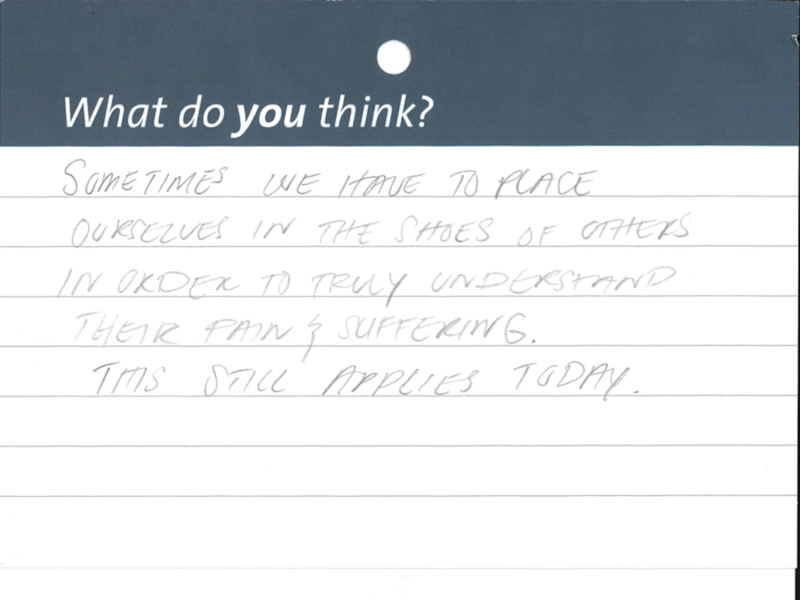 Some of the most poignant visitor comments explicitly link the exhibition to their own personal histories and lived experiences. “When I walk around this place, I can feel the whip of the overseer on my back. I can hear the cries of families torn apart. I also feel a greater connection to my people. The exhibition includes many voices of descendants of individuals enslaved at Montpelier and abroad, and the descendant community was integral in the creation of The Mere Distinction of Colour and continues to be a driving force for much of our programming revolving around difficult history. Many of our visitors are struck by the humanity revealed through the exhibition and reflect on their emotional connection with the history. One of the goals of exhibition was to help visitors see slavery’s relevance to the present. For some, that message is received loud and clear. They reflect on race in America. 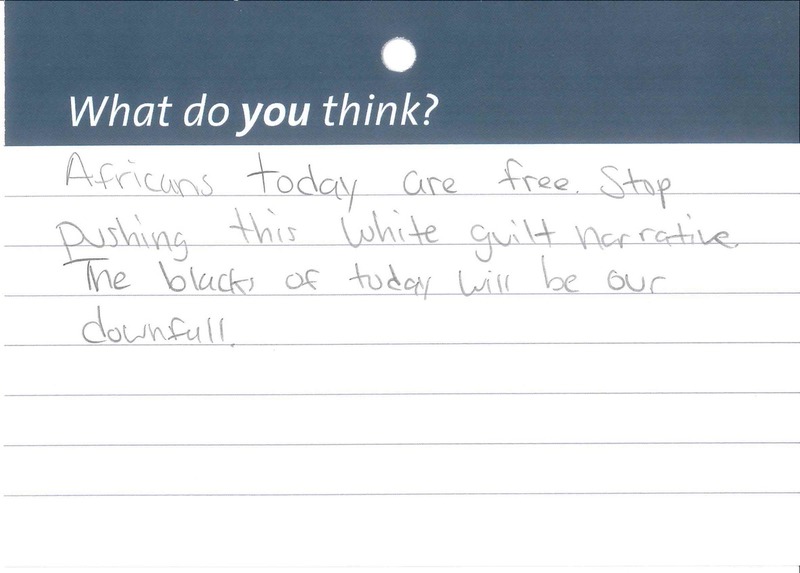 Many comment cards reveal our visitors’ struggles with the complexity of modern issues related to race in America, including prejudice and discrimination, oppression, racism, white fragility, and white supremacy. Numerous visitors draw upon the idea of rights and equality to express their views. “To live in unity does not require uniformity. We do not need to be alike for me to respect you." Others express their support by addressing universal ideals of shared humanity. This type of reaction is very common among younger visitors who tend to process the ideas slavery and race in terms of fairness and equality. A middle school visitor asked “Why is racism or race even a thing? I am not white, you are not black. We are people, human beings who have fought long and hard, since the beginning of us being on this planet. There is no such thing, of us being white, black, Asian, Latino, none of that. We should always remember that not everything about us is different. There is one thing about us that is the same. We are all people." 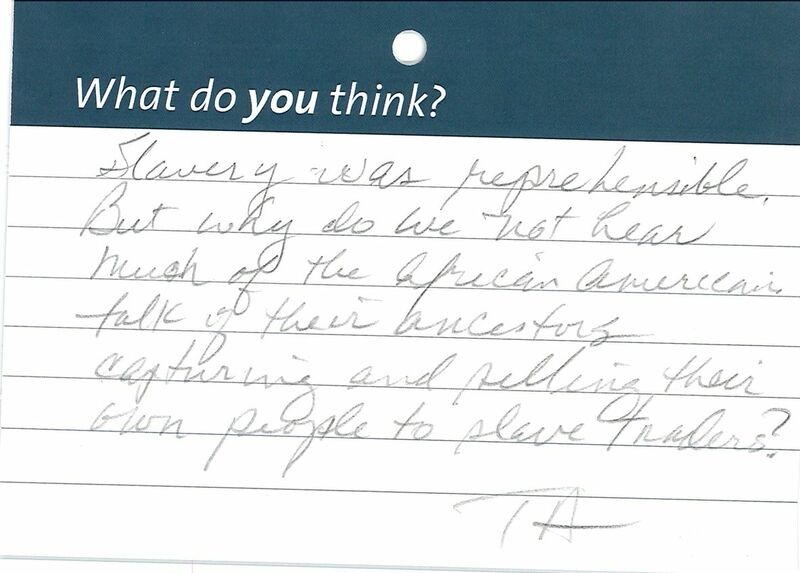 There are visitors who recognize and react to the many ongoing legacies of slavery in modern America. But one of the most remarkable phenomenon we've noticed, is people having conversations with one another. "You obviously missed the point. Please watch, 'why are we still talking about slavery' on the TV behind you." For many of our of white visitors, the exhibit's frank acknowledgement of legacies of race-based oppression spark anger, fear, and defensiveness. Other people coming through the exhibition are scanning the cards, and often feel compelled to respond. The end result is the analog version of comment sections of articles on the Internet, with other visitors commenting directly on others' thoughts before them, sometimes cosigning ideas, but more often, taking to task and offering context to others' opinions. Sometimes it's out-of-context historical facts, sometimes, as above, it's religion. Such emotional responses are not particularly surprising, and in fact, are disappointingly common when slavery and ongoing issues of racial injustice are examined publicly. 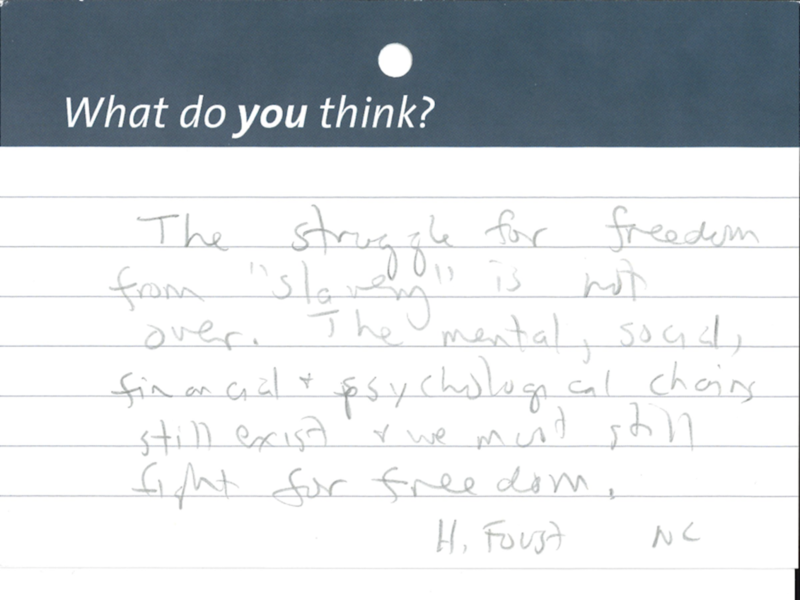 The strong reactions shared on comment cards demonstrate a variety of defenses used by some visitors to avoid feelings of shame and guilt associated with slavery and its legacies. "Slavery was reprehensible. But why do we not hear much of the African-Americans talk of their ancestors capturing and selling their own people to slave traders?" These responses often manifest themselves in the form of acknowledgement that slavery was bad, BUT... as if to absolve themselves and their ancestors of guilt, or preserve their sense of untainted, nationalistic pride. There are mentions of the slaves being treated fairly. "Some slaves were given inheritances & treated like family - why such a one sided story here??" Some put forth that slavery was not strictly an American phenomenon, and try to contextualize American slavery in comparison to other historically disadvantaged groups such as the Irish, the Polish, and the Jews. The idea of racial oppression seems deeply connected with a feeling of blame. Some assert that it was an ill of the past, a historical anachronism that those complicit can't possibly be held accountable for, and we should all move on. 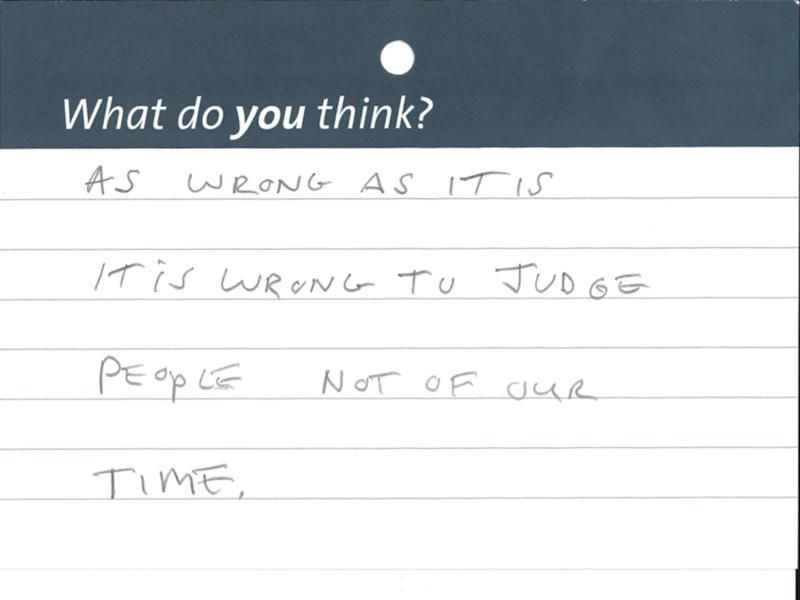 "As wrong as it is it is wrong to judge people not of our time." "The past is a foreign country, they did things differently back then. Let it GO people." And unfortunately for some, the exhibition is too much to handle, or they aren't prepared, or equipped, to digest the content. These visitors are unable to engage with modern material, and have a hard time comprehending the political, and social differences that we still live with in the United States. "Africans today are free. Stop pushing this white guilt narrative. The blacks of today will be our downfall." It's important to understand that because we leave these comments up for others to see does not mean that we in any way endorse or legitimize these viewpoints as correct or valid. 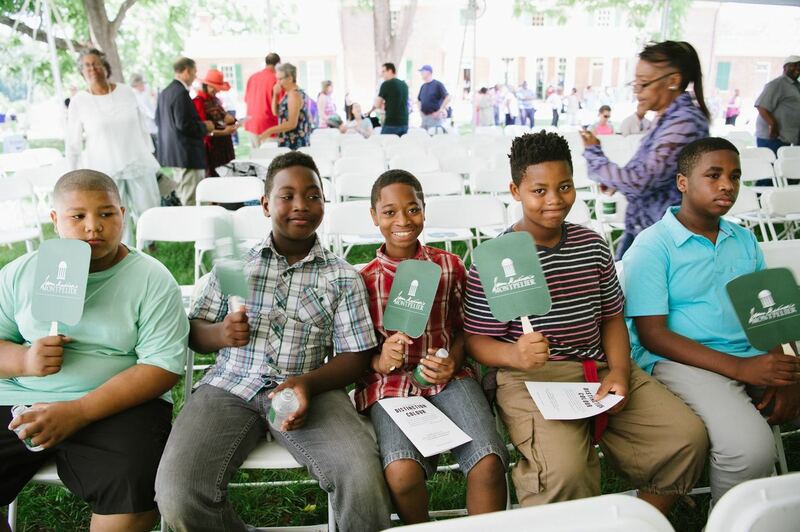 We leave them visible to demonstrate the necessity of education and dialogue in addressing white fragility and when dealing with the destructive and devastating history of slavery that we all share as Americans. We leave them up because we are a cultural institution committed to truth, with the understanding that history is messy and that we are still coming to grips with the ramifications of our past. The Mere Distinction of Colour is intentionally provocative, but that doesn't detract from its fact-based foundation and years of historical and archaeological research. We want visitors to leave wanting to talk about it, feeling angry, or curious, or empowered. Although the subject matter is challenging we are encouraged by the majority of our visitors' willingness to engage intellectually and emotionally with the critical issues raised in the exhibition. 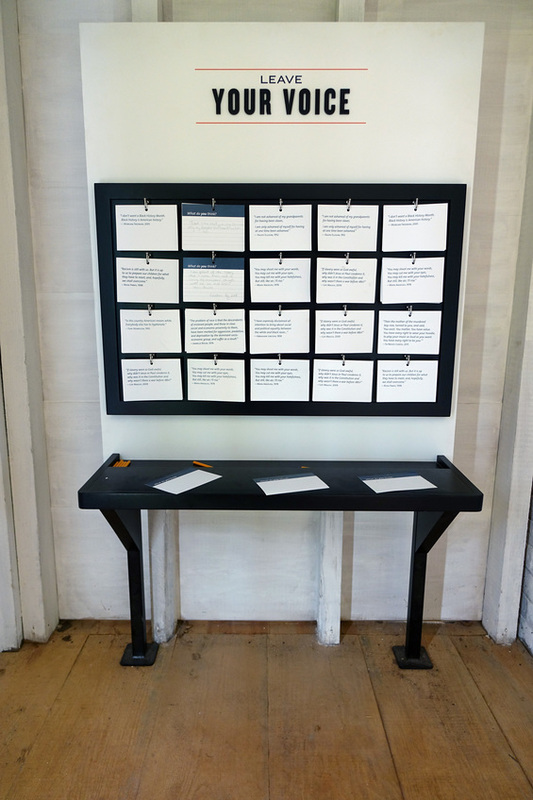 The "Leave Your Voice" cards highlight the fundamental importance of conversation and making a discussion of difficult history accessible to everyone. Unedited visitor reflections, both positive and negative, are important for others to see. Unfortunately, even in 2019, offensive and insensitive remarks are not uncommon. These cards demonstrate not only a range of understanding of American history, but also how our visitors are actively working their way through conflicts with society, each other, and themselves. Listen to Senior Research Historian, Hilarie Hicks, and Director of Marketing and Communications, Price Thomas, speak more on this topic with Stewart Harris on this episode of Your Weekly Constitutional. Come visit and let us know what you think. "We cannot simply disregard the past because it is uncomfortable to discuss. We must have an open dialogue, a safe, honest, and accepting forum to learn and grow from each others opinions. To make any progress, we must converse and keep history alive. We must learn from our mistakes."